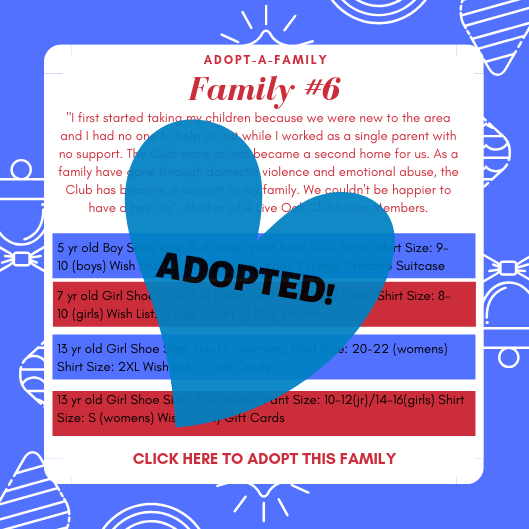 Make Families’ Futures Bright this Holiday Season! For many families at the Boys & Girls Clubs of Santa Cruz County, the holidays can be an especially trying time. 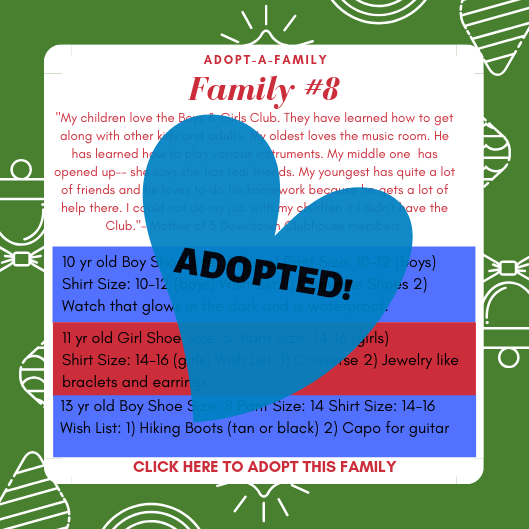 Each year, our Club hosts the Adopt-a-Family program to pair generous donors with families who could use a little help for the holidays. 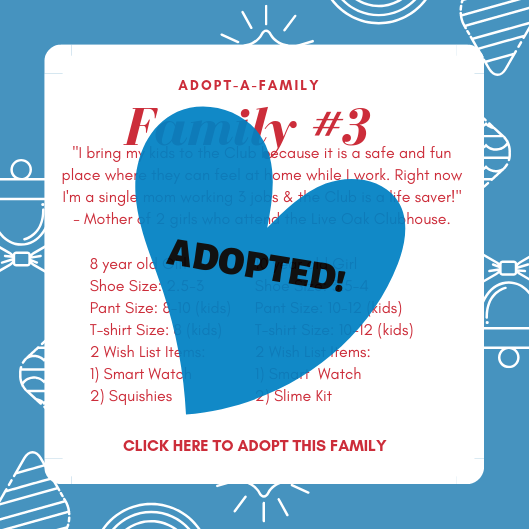 We invite the community to spread warmth and cheer while creating lasting holiday memories by adopting a family this year! 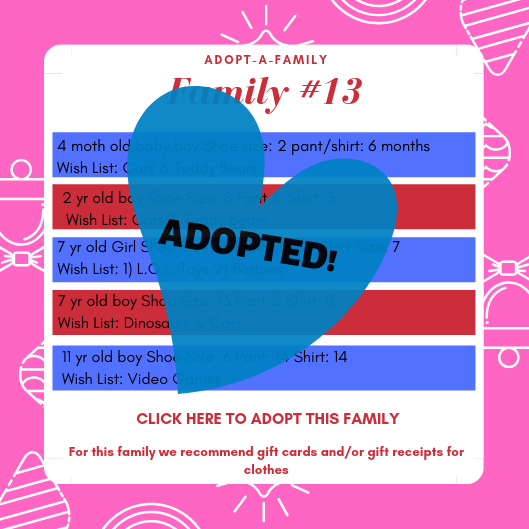 You may either choose a family to adopt from the tags below or donate to our Adopt-a-Family Program where funds will go to purchasing gift cards and gifts for families in need. 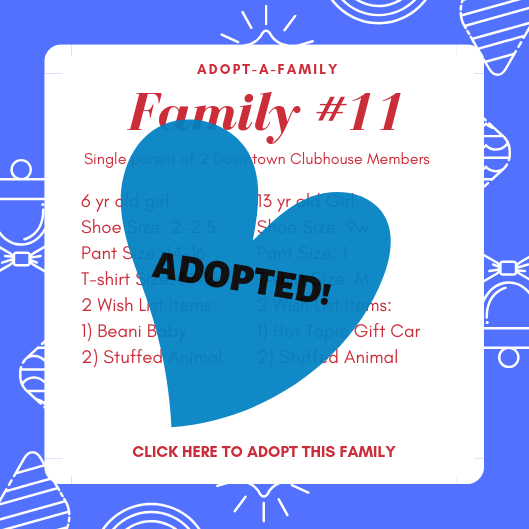 Club members and their families will be nominated to be part of the Adopt-a-Family program by Clubhouse Directors. Generous community members team up with family, friends, neighbors, or coworkers to brighten a family’s holidays. 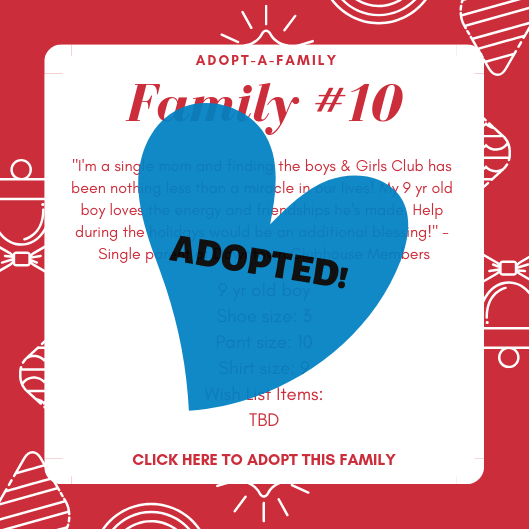 Groups or individuals who would like to “adopt” a family can click the button below or contact Alexandra at alexandra@boysandgirlsclub.info or 831-423-3138 ext 26 to sign up and determine the size of the family you’d like to adopt for the holidays. 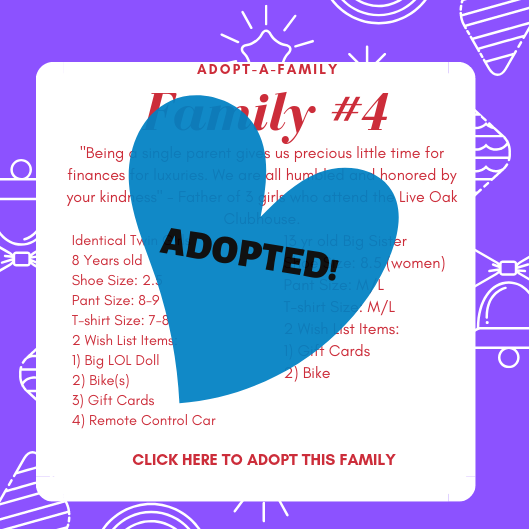 While there’s no minimum requirements, donors typically spend approximately $100 per child in the family ($50 for toys and $50 for clothes). 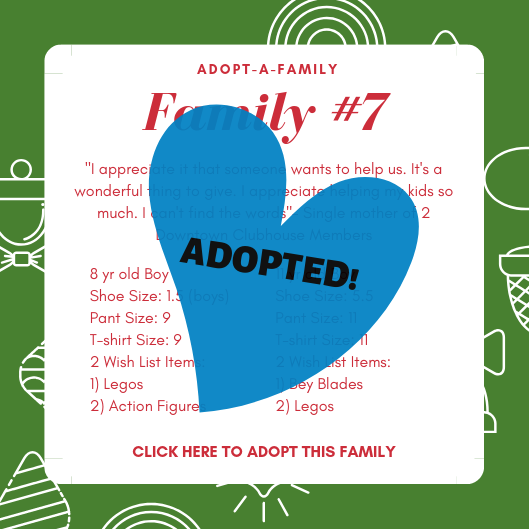 Donors purchase gifts for the family they are adopting and wrap them, labeling with the family’s personal tag. Donors drop off the gifts to Boys & Girls Clubs of Santa Cruz County Downtown Clubhouse/Administrative Building (543 Center Street Santa Cruz) no later than Friday, December 19th. 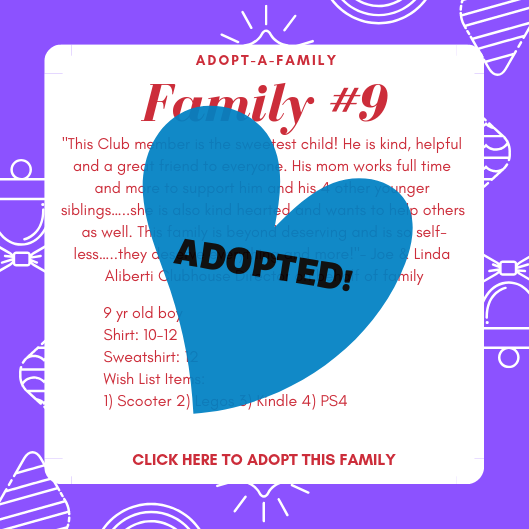 Adopted families will be contacted by Clubhouse Directors and receive their gifts before Christmas. The holidays become a more cheerful time of year for all! 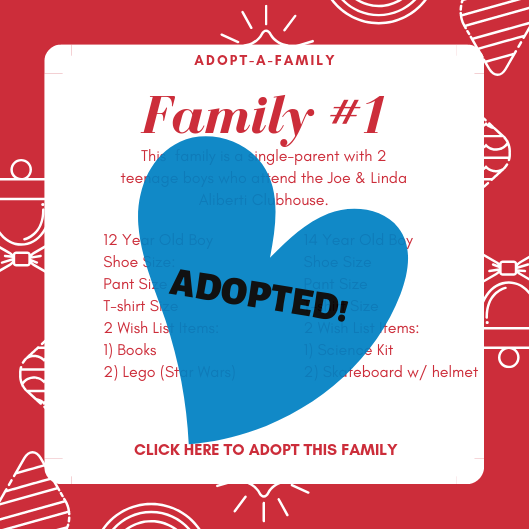 You can support our Adopt-a-Family Program in two ways. 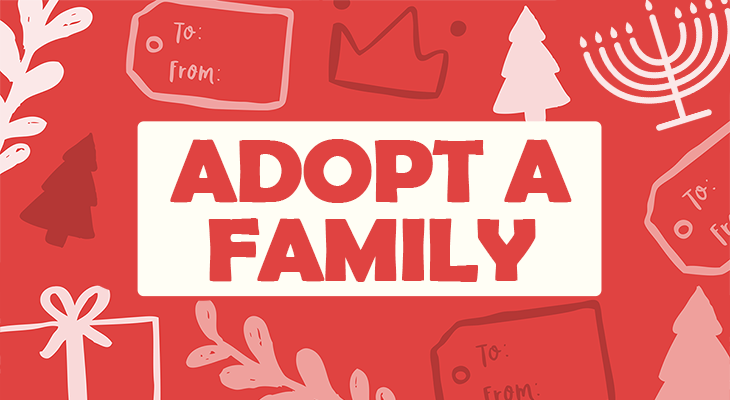 Donate directly using the button below to our Adopt-a-Family Program to enable Clubhouse Directors to purchase gift cards and gifts for families in need. Chose which family you’d like to “adopt” from the “tags” below!